Or view larger version. Jason Kidd in Saint Joseph's high school uniform with basketball in hand, driving to hoop in 1992 North Coast Section championship game. March 14, 1992. Daniel J. Murphy, photographer. Gelatin silver print. Collection of Oakland Museum of California. The Oakland Tribune Collection. Gift of ANG Newspapers. 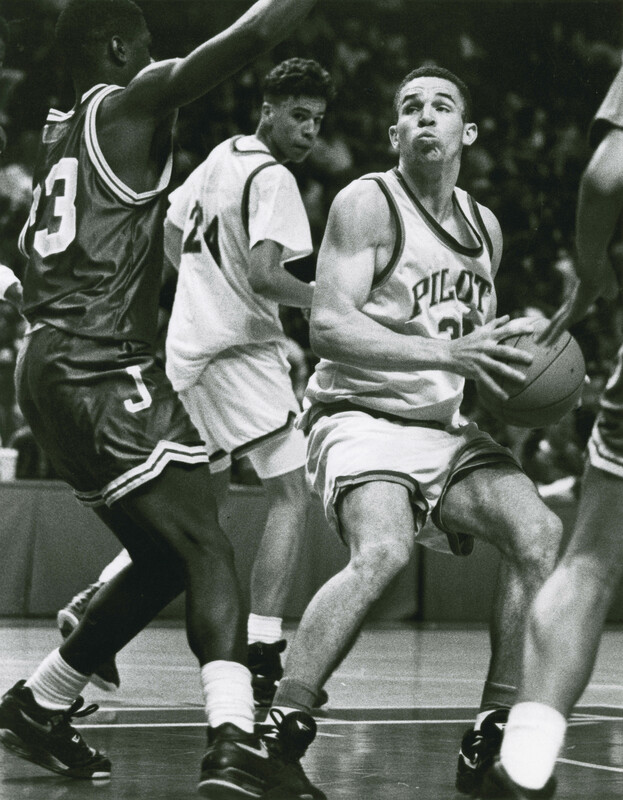 St. Joseph's high school guard Jason Kidd drives to the basket in a 1992 North Coast Section championship game at the Oakland Coliseum Arena. Kidd led his team to the California Division I state title in both 1991 and 1992, compiling an overall 63-6 record along the way. He was named California High School Player of the Year both seasons. Following his senior campaign, in which he averaged 25 points per game, 10 assists, seven rebounds and seven steals, Kidd was selected for the Naismith Award as America's most outstanding high school player. Parade Magazine and USA Today also selected him as national prep player of the year. Kidd played two seasons at the University of California-Berkeley and was selected to the 1993-94 All-America team, following his sophomore season. Later that year, he was a first round draft choice of the Dallas Mavericks and left college to begin a stellar NBA career. Through the 2001-2002 season, Kidd was selected to the All-NBA team five times and to the All-NBA Defensive team on three occasions. Kidd played for the Mavericks from 1994-95 through the 1996-97 season, before being traded to the Phoenix Suns. He played for the Suns until 2001, and then was traded to the New Jersey Nets. Kidd led the Nets to the 2002 NBA finals, where they lost to the Los Angeles Lakers. He has played in six NBA All-Star games as of 2003 and was a member of the 2000 Gold Medal USA Olympic team.